Fermenting our foods before eating them is like partially digesting them beforehand. Some people who cannot tolerate milk, can tolerate yogurt. This is because the lactose is broken down through the fermentation process, and the lactose is the part of the milk that some people have a hard time digesting. Fermented foods are good for digestion. Our guts need a certain amount of good bacteria to thrive. Lactose intolerance, allergies, gluten intolerance, irritable bowel syndrome, yeast infections, and asthma have all been linked to improper amounts of good gut bacteria. Fermented foods restore the balance! Great to eat after antibiotic use by the way. Our bodies need enzymes to properly digest, absorb, and use the food we eat properly. As we get older, our enzymes get depleted. Fermented foods are an excellent source of enzymes. Fermenting foods up the vitamin content! Why bother eating healthy foods if we can`t absorb the nutrients in the foods we`re consuming? Eating fermented foods aids absorption. Have a bumper crop from your garden this summer? Great sale at the store on carrots and cabbage but you can`t take advantage of it because it`ll go bad? Fermented foods last longer! You`ll save money making your own instead of buying it. It`s cheap, it`s easy, and you don`t need special gadgets. Fermenting food is inexpensive. The vitamin C content is very high in sauerkraut and it is an excellent immune system enhancer. Wash your cabbage and remove the outer leaves. Save them for later use. Cut it in half and remove the core. It can stay in but it takes alot longer to reach full fermentation because it`s thicker. Chop or shred your cabbage. If you`re chopping/slicing, the thinner the pieces, the quicker it ferments. If you`re adding carrots, shredding them is the best prep method. If you`re adding onions, slice them thin, or you can dice them. Sauerkraut is highly customizable, do what you fancy! Put all of your chopped goodies into a bowl or crock and sprinkle with sea salt. I use about a tablespoon or so for each head. I don`t measure so I can`t give you exacts. The salt is what draws out the moisture in the cabbage and creates your brine. Also add any other spices you might want like dill, cayenne pepper, or some other taste you enjoy. Massage the cabbage mixture or use a mallot to squish and pound it. 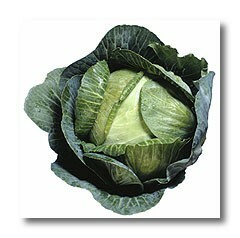 Your goal is to break down the cellular walls so the cabbage starts 'sweating' and releasing its moisture. If you don`t get some liquid, you can add filtered water if needed. I`ve never had to, but I`ve read where some people do. After you get some liquid action going on, this is when I put mine into mason jars. Pack it in real tight, put one of the saved outer leaves over the shredded mixture and push it down, then screw the lid on really tight. Some people leave theirs in a crock, put a plate on top, and add some sort of weight. I haven`t done it that way but I probably will try it once I buy a crock. You want your cabbage to be submersed in the brine and pressure on the cabbage, which is the reason for the plate and weight. I`ve found that the outer leaf works just fine for me so far. This is where your patience comes in. You wait. It usually takes anywhere from a week to 4 weeks to finish. The colder the environment, the longer it takes. This is why I leave mine out on the counter, over in a corner somewhere, as opposed to a basement or fridge. After a week or two, open up and enjoy. Don`t panic if there`s a bit of mold or 'bloom' on the surface. It won`t hurt you and it`s not in the rest of the kraut. Just scoop it off and go along with your business. My next project will be to try and make some Kim Chee. I love the stuff!! For use with 10 - 15 liter fermentation crock. Ceramic stone weight for holding vegetables in place while fermenting. No one in my family likes it either Jimmie. It`s ok, then it`s all mine!! This is something I really want to try. Unfortunately my daughter and husband do not like sauerkraut. I love it, though! I should make it just for me.